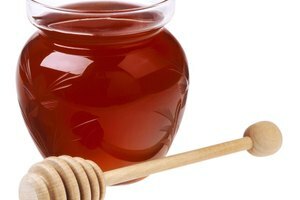 Raw or unprocessed honey hasn't been heated or treated in any way. Most honey at the store is raw, as heating the honey changes its flavor and color. Some raw honey might still have bits of honeycomb in it, depending on whether it was filtered prior to bottling. 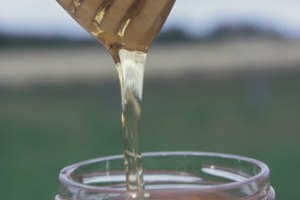 When properly stored, honey can retain most of its flavor and remain edible for two or more years, though raw honey is more likely to become cloudy when compared to processed honeys. Wipe the rim of the jar with a clean, slightly dampened cloth. Remove any honey residue from jar threads for the screw-on lid and from the threads on the lid itself. Removing the residue ensures a tight seal. Screw the lid onto the jar tightly. Turn the jar upside down and check for any leaks. If the jar leaks, transfer the honey to a clean jar that will seal properly. 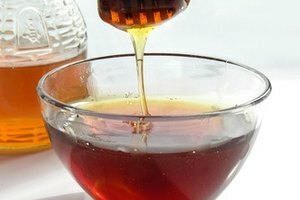 Place the honey in a dark pantry or a room with temperatures near 50 degrees Fahrenheit. Avoid storage areas where temperature fluctuates often. Honey doesn't grow harmful microbes because it has low water content. Improperly sealed jars allow moisture in, which makes honey more prone to spoilage. 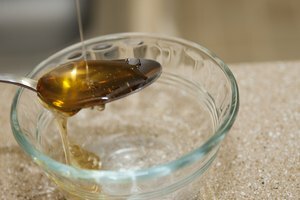 If the honey forms sugar crystals and begins to solidify, place the honey jar in a bowl of warm tap water until the crystals dissolve. Dispose of honey if it is foaming, has visible mold growth or smells sour.